Gentlemen, let me introduce you to Dovo Straight Razor. A little over a hundred years ago, the only way you could get a decent shave was with a straight razor. Technology has improved to the point where men can shave with five blades, or more, at one time. Despite these advances, consensus says that the closest shave still lies with the straight razor. There’s something to be said about tradition. Men expect results when they spend their hard-earned cash on their shaving materials, and if they don’t get it, they don’t buy from that company again. DOVO has long understood this. They have been producing the highest quality blades in Solingen, Germany since 1906 and have earned a reputation that is second to none. 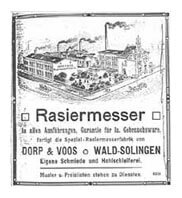 Founded in 1906 by two entrepreneurs named Dorp and Voos, DOVO Steelware of Solingen, Germany was a small factory with a forge and hollow grinding shop that produced straight razors. The area was already known for quality cutting tools and they were able to capitalize on this reputation to become one of the most recognizable names in men’s grooming tools. DOVO’s reputation had grown to such a point, that by 1938, the German government protected the name of the area in which DOVO produced their blades by enacting a law. The law states, among other things, that in order to have the privilege of using the “Solingen” name on a product, the materials must originate from that area and the product must be manufactured in the area. It also makes a distinction between hot-forged and cold-forged metals, which cannot claim the Solingen name. Because of this law, the city of Solingen is now synonymous with high-quality craftsmanship. According to DOVO, their blades are always shipped ready to shave. This means that you don’t have to sharpen them, take them to a honemeister, run them across a strop, or any other sort of prep work. You can take them out of the box and get down to the business of getting the ultimate shave. That said, there are a few things to consider before purchasing a DOVO straight razor. Pick one that suits your needs, your level of comfort, and level of skill. Carbon steel is more flexible than stainless steel. This makes the blade much easier to sharpen than other metals, but the drawback is that it doesn’t hold the edge as long. What you’ll get with a well-honed carbon steel razor is the closest shave possible. This sort of blade is the type recommended for beginners because Once you’re done shaving, though, you have to ensure that the blade is completely dry, as well as the handle it rests in. If not, it will quickly rust. Apply a light layer of fine grade machine oil to keep the blade protected for long-term storage. These days, most blades are made of stainless steel. This reliable material is harder than carbon fiber, which makes it a little more difficult to sharpen, nor does the blade get as sharp. However, the blade stays sharper longer than a carbon fiber one. A beginner may not be able to tell the difference, but an experienced shaver will know the moment the blade touches skin. The fact that stainless steel keeps an edge may seem like a huge advantage, but once the blade loses its edge, a lot more sharpening and stropping is involved in getting the blade back into cutting shape. The grind as an indication of the amount of metal that has been removed from both sides of the blade. The more that are removed during the grinding process, the thinner, and less wedge-shaped the blade will appear. A full hollow grind straight razor is more flexible blade than a half-hollow one. A flexible blade is easier to sharpen, however, they are more prone to nicks. If you are a beginner, you should consider a half-hollow blade. This is because you don’t have to spend as much time keeping it sharp, and you’ll most likely save your skin from unnecessary abuse. The standard DOVO blade is 5/8 inches. This measurement is something common to most blade manufacturers because it offers the perfect balance of firmness, flexibility, and usefulness. The wider the blade, the more flexible it becomes. The width of the blade can also play a factor in saving under the nose, behind the jaw, and around other obstacles, such as moles. Thinner blades, such as that are used in the DOVO Shavette, are often recommended for beginners because it gives them a little more room to maneuver around delicate areas of the face. This out-of-the-box, shave-ready offering from DOVO features a ground carbon steel blade with a rounded tip. Carbon steel is known for easy sharpening and holding its edge longer than other metals. This means that with a few strokes across the strop each time before you shave, you will get months out of the razor between sharpenings. The ebony handle is lightweight and fits comfortably in your hand for perfect control with every pass across your whiskers. The only drawback with this razor is the tendency for carbon steel to rust if exposed to moisture for long. Keep your blade dry when not in use and you can be shaving with it for years to come. No frills here. One looks at this offering from DOVO, named Best Quality Straight Razor, and you’ll know it’s all about business. It has the look and feels of your great-grandfather’s straight razor, but instead of a blade that requires plenty of maintenance, it has a full hollow ground carbon steel blade that will hold its edge after dozens of shaves. Along with the blade itself, the handle is made of a water-resistant plastic that provides lightweight comfort and a sure grip that won’t slip. With a modern twist on a classic grooming tool, the DOVO Silver Shavette is all about getting the job done. The aluminum design makes it light-weight, easy to care for, and cost-effective: perfect for the man who wants a great shave but is on a tight budget. But what really makes this particular razor special is that the actual blades are disposable. The red insert fits standard double edge (DE) blades. This gives you the ability to purchase inexpensive blades and you won’t waste time on maintenance. You’ll never have to hone or strop another blade, and you don’t have to worry about it rusting. Get the closeness of a straight razor with the convenience of a disposable at an affordable price. Inserts are another advantage of the DOVO Shavette. They are shipped standard with red inserts, which are designed to hold double edge (DE) blades. Green and black inserts are also available but are sold separately. Green inserts fit Persona hair shaper blades while black inserts fit DOVO long blades. Finding a straight razor that fits your needs and your budget can be a tough task. There are plenty companies that offer basement bargain prices and proclaim that you will get the “closest shave of your life.” And that may be true, for a pass or two over a day-old growth of whiskers. But you’ll soon learn that you get just what you paid for. 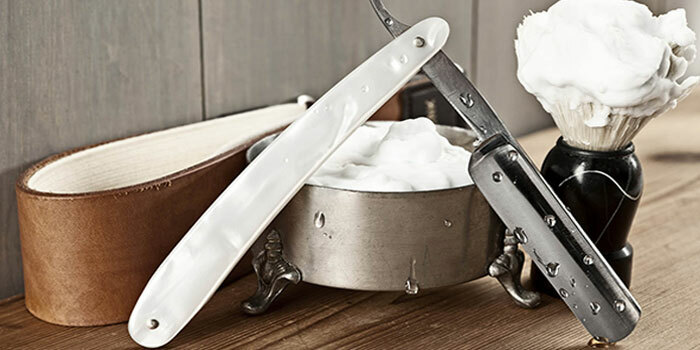 The reputation of DOVO straight razors has long stood the test of time ever since Dorp and Voos set up shop in Solingen, Germany over a hundred years ago. This is because DOVO continues to create world-renown quality, and you get what you pay for: a shave-ready blade that requires less maintenance than those by other manufacturers, and the satisfaction of close, comfortable shave that you just can’t get any other way. If this article was useful for you, feel free to share it. If you have any questions, ask them in comments below. You may also like to read our Best Straight Razor Review or Ultimate Guide to Merkur Safety Razors. Thank you! It’s Dovo “Pearl” Straight Razor. Should one be concerned if a Dovo razor comes stamped or etched? I read a Dovo razor, comes with lifetime honing. If true what is the process to send for honing.